Saturday - June 30, 2012 - Rebecca Frey, whose GREAT DANE mauled a 5-year-old boy, pleaded guilty Friday to one of two charges stemming from the attack. She was sentenced to pay the boy's medical bills- $790, fines - $100, and court fees and costs. The second charge was withdrawn after Frey, who did not have an attorney, pleaded guilty. Frey approached the mother holding her son at the hearing and apologized for what happened. The boy was visiting Frey's house on May 20 when the male Great Dane attacked and bit the boy's head and neck. The child was taken to Lehigh Valley Hospital in Salisbury Township, where he received stitches and other treatment for his injuries. ANOTHER ARTICLE: THE BOY SUFFERED A PUNCTURED EARDRUM, AN INJURY TO HIS EYE AND SEVERAL BITE WOUNDS - THE DOG HAS BEEN MOVED TO LIVE WITH RELATIVES. UPDATE: The Hobart Chamber of Commerce has muzzled plans by a group of Pit Bull owners to march in the Fourth of July parade with their dogs and hand out literature. Mike Adams says it's no place for any animal to handle with fireworks going off, a military flyover scheduled, A HORSE CARRYING THE GRAND MARSHALL, and large crowds of children and adults gathered. JUNE 18, 2012 - "I'D LIKE TO SEE A PIT BULL BAN OR SOME KIND OF ORDINANCE THAT IS MORE STRINGENT THAN THE ONE ON THE BOOKS RIGHT NOW," SAYS SHERRYL DOERR ..
Doerr, who works as an assistant to the director of development and educator for the municipal stormwater and sewer systems, said she"ll attend the city council meeting in the capacity of a resident and not an official. She is singling out PIT BULLS because her daughter, Melissa Blake, of Hobart, watched helplessly a few months ago as her pet dog was attacked and viciously killed by a PIT BULL in her backyard. Since that attack, her daughter has witnessed two other incidents of PIT BULLS attacking other dogs, including once when she was pushing her young child in a stroller. DOERR SAID HER DAUGHTER BECAME HYSTERICAL. NEXT TIME INSTEAD OF A DOG GETTING ATTACKED, IT COULD BE A CHILD. "A STAFFY IS ATTEMPTING TO CHEW ITS WAY INTO MY CAR!" The victim said she was concerned about a dog that was in the middle of the road and she got out and approached it and it attacked her biting her legs. She managed to get away and get inside her car. When emergency services arrived, the dog ran off. The victim was taken to Treliske Hospital whee surgery was required on her leg. Because this happened near a school, all efforts were made to locate the female Staffordshire Bull Terrier. At 2:20 am it was located but they were unable to capture it. An hour later they cornered it and a Police dog handler wearing a padded sleeve managed to get the dog into a cage in a Police car. In the process the dog managed to damage part of the car, a dog loop, and a Police hat. The Bull Terrier was taken to a vet and the decision was made to put it down even though the owner had not been located yet. Friday - June 29, 2012 - An unprovoked attack by a family dog caused traumatic harm to a 4-year-old boy on June 27. WYATT WILCOXSON of Sevierville was reportedly playing with the family's Rottweiler, when the dog suddenly attacked the boy. The boy was bitten all over his face, ears, and under his eyes, and he had numerous puncture wounds on his body. He was flown to UT hospital. They had to reattach his ear but not all of it was there. He needed 20 staples from his head to his neck. The boy is recovering and is in stable condition. The dog was euthanized the next day. Friday - June 29, 2012 - A landlord was attacked by a PIT BULL on Thursday afternoon during a visit to a tenant's home on Rushin Drive, the Athens-Clarke Police said. The dog jumped on the 31-year-old woman's chest and bit her hand and thigh. She went to the hospital for treatment, and the county animal control officer took possession of the Pit Bull while they investigate the attack. ENGLAND - PIT BULL/ MASTIFF MIX ATTACKED KAY PIATEK AND HER 3 YORKIES WHILE THEY WERE TAKING A WALK IN SEPT 2011 - SHE TELLS THE COURT "I LOST MY DOGS, MY JOB, MY LIFESTYLE, MY INDEPENDENCE - WHERE DO I GO FROM HERE ? Kay Piatek detailed the devastating effect the attack had on her life after KIRK FLEMING, 31, appeared at Cardiff Crown Court yesterday where he admitted owning the PIT BULL/MASTIFF CROSS that attacked Mrs. Piatek and her 3 Yorkies. Her beloved pet MAXI was killed, and Mitchie died afterwards. She still has Alfie. "HE SHOULD GO TO PRISON AND BE PUNISHED FOR ALL THE STRESS AND TRAUMA IT CAUSED. I LOST MY JOB, MY LIFESTYLE, MY DOGS, MY INDEPENDENCE. MY LIFE HAS BEEN TOTALLY RUINED. WHERE DO I GO FROM HERE?" Tuesday - January 10, 2012 - A Newport man will stand trial accused of not being in control of a dangerous dog which injured a woman. KIRK FLEMING, 31, of Alexandra road, Pill, is charged in connection with an incident on Mendalgief Road on September 24, 2011, which left KAY PIATEK WITH A FRACTURED ARM. At Newport Crown Court yesterday, Fleming pleaded not guilty to one charge of not being in control of a white PIT BULL/MASTIFF CROSS male dog which was dangerously out of control in a public place. The case was adjourned ahead of a two-day trial due to start on March 1. Fleming was released on bail. BRIAN OZENNE SR. KICKED AND PUNCHED AND PUT HIS ARM AROUND HIS SON'S NECK TO KEEP THE DOG FROM BITING HIM ON THE THROAT. On June 17 a dog said to be a PIT BULL/MASTIFF MIX chased 10-year-old Brian Ozenne Jr. down in his yard as he ran for his house at 9 Longview Drive. The dog bit him in the back, neck, head, and buttocks. The dog severed part of his right ear. "MY DAD PUNCHED IT SO HE LET GO AND THEN IT GRABBED MY BEHIND. IF HE GOT MY EAR MORE, I WOULD NOT HAVE IT." Brian is recuperating and still has staples in the top of his head to close puncture wounds and a bandage over his mangled ear, which will require reconstructive surgery. He has had nightmares and wakes up screaming, "MOM, HE'S GOING TO GET ME AGAIN !!!" His parents are just grateful that their son didn't suffer more serious injuries. Brian's mother, Yvonne Ozenne, finally beat the dog off her son by grabbing a push broom and striking the dog on the nose. Now they both are very angry that DAWAYNE FLEMMING, the owner of the dog, has told police that he intends to fight the department's order to euthanize the dog and they are afraid he intends to bring the animal back to his home. Flemming has a Hartford address but evidently the dog and a daughter was at a girlfriend's address when it attacked Brian. VERMILION PARISH LA -LOOSE PIT BULL ATTACKED JOGGER - IS IT "VICIOUS" OR "DANGEROUS" AND SHOULD IT BE PUT DOWN? - A COMMENT ON THIS ARTICLE TELLS THE REAL STORY !!! "I NEVER SAW THE DOG COMING. IT JUST STARTED BITING THE BACK OF MY LEFT THIGH AND THEN MY RIGHT THIGH. I JUST STARTED SCREAMING AND I WAS KNOCKED DOWN." Police juror Mark Poche explained to Anne Vincent, the pit bull's owner, that she has until Monday to get a judge to listen to her plea on why her Pit Bull should not be put down and then the judge can rule and call Moresi on his decision. If the judge rules the dog lives, then the dog can go home to Vincent. If the judge refuses to hear the argument or rules against Vincent, the next day the Pit Bull will be put down. Pit owners prove everyday that 1) they do not care about others and/or 2) they fail to understand their dogs escaping, mauling and killing abilities and instincts. Tragically this Pit owner failed this dog. Every week approx. 20,000 pits are killed in pounds in the US; most do not have a biting history, they simply were born when pit over population was high, and too many pits were born for each to live. The best predictor of future behavior is past behavior. This dog's owner will, in all probability fail her dog again. Next time the victim may not survive. Tragically, the correct answer is to euthanize this dog. the owner should be banned from owning or living with a dog over 15 pounds; If she is considerate of others, she would not acquire a dog over 15 pounds. small dogs might really want to "rip your arm off", but lack the ability and instincts to do so. Pits can and have maimed and killed. The fault of this attack also must be shared with pit mongers/pit pushers. Those who tell the naive public that pits will only attack if encouraged or trained to do so. No one thinks that beagles will only sniff and bark unless trained to do so. Mauling is a Pit instinct, just as sniffing and barking is instinct to most beagles. The only thing that Pits do better than other dogs is escape, maul, and sometimes kill neighbors. BAN PIT BULL BREEDING. EVERYONE SANE AND COMPASSIONATE WINS. ALL DOGS WIN, ESPECIALLY THE POOR PITS THEMSELVES. Thursday - June 28, 2012 - Police responded to a call at about 9:30 am on Swigert Avenue that a mail carrier had been attacked by a large brown PIT BULL. The victim had suffered significant injuries to his left forearm and legs. A 3 inch x 3 inch chunk of tissue was ripped away from the victim's forearm and he suffered multiple bite wounds around his wrist and left leg. Responding officers reported the animal to be barking in a threatening manner and when the Animal Control Officer took control of the dog, he was bitten on his boot. Thursday - June 28, 2012 - A Muskegon resident was going to his vehicle Wednesday around 6:40 am in the 1800 block of Dyson Street when a male white and black PIT BULL charged the man. He managed to grab a metal pole leaning against his house and forced the dog back. The dog continued to charge him so he got back in his house and called police. Because animal control does not respond to calls that early, 2 police officers came and attempted to get a noose around the dog. But the dog barked and growled. The officers went through the man's house in an attempt to get closer to the Pit Bull but it continued to threaten them. They used pepper spray but the dog then charged one of the officers and bit him in the leg. It was then shot and killed. The owner has not come forward yet. Authorities say they have had an increase in loose dog calls recently..Per the city's animal ordinance, a PIT BULL IS CONSIDERED A DANGEROUS ANIMAL AND HAS TO BE PROPERLY SECURED OR THE OWNER COULD BE CITED. Thursday - June 28, 2012 - Yesterday a 10-year-old girl was walking her Pomeranian when a neighborhood PIT BULL got loose and attacked it. The mother and daughter were also injured in the attack. The owner of the 1 1/2-year-old female Pit Bull says his dog was used to protect his house. Tasha Montgomery says they buried their beloved pet this afternoon in their backyard. "THE CITY NEEDS TO STEP IN. THIS HAPPENS EVERY SINGLE DAY. KIDS ARE GETTING MAULED. CHILDREN ARE DYING. PEOPLE'S ANIMALS ARE GETTING KILLED. AND NOW I'M A PART OF THAT POPULATION. I'M FEELING THE PAIN AND THE HURT AND THE SORROW OF NOW, WHAT TO DO NEXT." The Pit Bull has been impounded for rabies testing. The victim says she plans on moving forward with a vicious dog hearing through Animal Control. Earlier this year courts classified PIT BULLS as 'inherently dangerous'. Thursday - June 27, 2012 - Police were called to a house in the 3700 block of elderberry Drive about 4 pm Tuesday when a baby was attacked by the family's PIT BULL. When police arrived, the boy's father had already taken his son to Clear Lake Regional Medical Center for treatment. The baby had a puncture wound above an eye, scratches to his face and a deep cut on top of his head that required stapling. The 5 to 6-year-old Pit Bull was turned over to animal control officers. Galveston County Health District spokesman Kurt Koopmann said the dog would be held in quarantine for 10 days. The case will be turned over to Dickinson Police Department's Criminal Investigation Division for a review. "PUSHED PASSED THE FRIEND WHO LIVES THERE AND KNOCKED THE OTHER YOUTH TO THE GROUND AND PROCEEDED TO ATTACK HIM." THE DOG WAS EVENTUALLY ABLE TO BE REMOVED FROM THE VICTIM AFTER THE BOY WHO LIVES THERE THREW WATER ON THE ANIMAL. The injured teen was taken to the emergency room of Edward Hospital in Naperville for treatment of bites to both of his arms. * iT'S NOT EVEN A 100 PERCENT PURE PIT BULL. * HE'S NOT A FIGHTING DOG. * HE'S BEEN RAISED AROUND CHILDREN. WOULD NOT LET GO AND THE BOY BEING ATTACKED KEPT SCREAMING!!!. It was a horrifying experience and as far as I could tell UNPROVOKED. AND I WON'T SOON FORGET THAT BOY'S SCREAMS. I AM MORE CONCERNED ABOUT THAT DOG. I THINK IT SHOULD BE PUT DOWN, OR AT THE VERY LEAST REMOVED FROM THE HOME. "THE PIT BULL JUMPED ON HIM TWICE SCRATCHING AND BITING HIM." The Chihuahua did not do anything except bark, the victim told police. The owner of the two dogs, Kiomy E. Galindo-Flores, told police that "when the front door was opened the dog went out and ran to the street." Galindo-Flores was issued a citiation for Nuisance Animals and fined $262. Wednesday - June 27, 2012 - A father and his friend were bringing groceries into an apartment Tuesday and left a 6-year-old girl and her sister alone in the apartment for a time with 2 dogs. When they returned they found the Pit Bull attacking the girl. The apartment belonged to a friend of the father. They pulled the dog off the girl and called paramedics. The girl suffered facial and head injuries and was transported to the hospital. San Diego Humane Officers took custody of the Pit Bull. There was also a German Shepherd in the apartment where the girls were left. The Oceanside Police Department's Family Protection Unit is investigating the attack. The father could face criminal charges for allegedly leaving the girls in the apartment with the animals. This is the second Pit Bull attack reported this month in the San Diego area. On June 14, a Pit Bull in Lemon Grove mauled to death an 8-month-old baby. That Pit Bull has been euthanized. Wednesday - June 27, 2012 - Patrolman Alexander Lanza was just 2 blocks away when he got the call to respond to the PIT BULL attack around 8:48 pm on Tuesday. When he arrived the dog was "VICIOUSLY BITING" a teenage boy in the middle of the street near the 7-11 store at West Webster Avenue. The boy's friends were desperately trying to fend off the attacking Pit Bull by hitting it with a bicycle. The patrolman sprayed the dog with pepper spray and then grabbed it, allowing the teen to escape. REFUSING TO LET GO !!!!!!!!!!! Lanza unholstered his gun but didn't fire it because children were nearby. Polakoski hit the Pit Bull several times with his baton and then grabbed the dog's neck while Lanza got away. The animal wasn't wearing a collar and continued to lunge at Polakoski. While injured, Lanza got the snare and secured the dog, but was bitten on the ankle while taking it to his police car. Patrolman Polakoski found that two 17-year-olds had been bitten by the dog. They were taken by ambulance to Overlook Hospital-Union campus for treatment of puncture wounds to their arms and legs. Patrolman Lanza was treated at the hospital for wounds to his thigh and ankle. NOW DETECTIVES ARE TRYING TO FIND WHO OWNS THE PIT BULL. Wednesday - June 27, 2012 - Officials are asking for the public's help in identifying the owner of a PIT BULL that bit a 12-year-old boy outside the Chango Elementary School last week. Town officials are alerting residents in the Malta/Ballston Lake area after a dog attack which happened June 18the around 6 pm on the sidewalk of the Chango School. The boy's mother says the dog bit the boy causing damage to his left arm. THE OWNER OF THE DOG IS SAID TO HAVE JUST WALKED AWAY. If the dog is not located, the boy will need a series of rabies shots starting this week. The owner is a woman described as white, in her mid-40's or 50's, thin, with shoulder-length grey hair. The dog is described as a white PIT BULL. Tuesday - June 26, 2012 - A woman suffered a serious hand injury Thursday morning when she was attacked by a PIT BULL. She was walking her Shih Tzu about 7:30 am when a Pit Bull being walked by a young boy attacked them. Witnesses say the young boy had no control over the Pit Bull. It grabbed the small dog and was dragging it and her hand got stuck in the leash as she tried to get her dog to safety and she also fell and hit her head. One neighbor heard her screaming to the top of her lungs crying out for help. A friend who usually meets them for their morning walk found her friend bleeding and crying. Doctors say they will be able to save her finger, but she will need surgery at a later date. The Shih Tzu suffered some scratches to the eye, but will survive. Tuesday - June 26, 2012 - An American Stratford ( Staffordshire???) Terrier being watched by a 19-year-old dog-sitter escaped out the door on Monday evening and ran across the street and grabbed a Rat Terrier being walked by the owner and a group of friends. The Bull Terrier would not let Jade go until 4 people began punching, kicking, and hitting it. The Bull Terrier was finally secured and taken inside the owner's residence. Jade was taken to a vet but there was too much damage and she was put to sleep. The owner of the PIT BULL was away on an extended vacation when someone in the house opened the door and the dog got out. "THERE WAS TOO MUCH DAMAGE. THEY PUT IT TO SLEEP....IT'S AN UNFORTUNATE ACCIDENT." The owner who was on ---"HER"--- way to South Dakota was contacted and is aware of the situation. THE PIT BULL IS TO REMAIN QUARANTINED FOR 10 DAYS AT THE OWNER'S HOME. Tuesday - June 26, 2012 - Haley Battin's 3-year-old Chihuahua, PRINCESS, had never been to the dog park in Austin ---PEOPLE IN AUSTIN HAD BEEN WAITING FOR THIS DOG PARK TO OPEN -- so she decided to take her Sunday.........now PRINCESS IS DEAD. Princess was in the "small dog" fence and in a split second this Pit Bull got in the enclosure and bit down on Princess. Battin says that the Pit Bull owner was doing nothing to stop the attack so she tried to stop it but it was too late and Princess was on the ground dead and the Pit Bull was gone. Police say the owner of the Pit Bull did come forward Monday morning. He claims he didn't realize how badly the Chihuahua was hurt. But Battin says he just took off with his Pit Bull and didn't even say 'I'm Sorry'. The Pit Bull has been taken by the dog pound. The owner has 2 weeks to contest in front of the city council. If he doesn't , his Pit Bull will be euthanized. "MY HEART CAN'T TAKE IT." She is now training for a supervisory position because last week's attack was the second serious dog attack she has suffered in less than 2 years. The Pit Bull that attacked her on Woodrow Drive on June 18 was euthanized by animal control that day. She is not sure the fate of the dog responsible for the August, 2010 attack on East Morrell Street in Otsego that sliced her left ankle to the bone and puncture wounds behind her knee.........THAT CASE IS THE SUBJECT OF A PENDING LAWSUIT. Tuesday - June 26, 2012 - A 12-year-old boy was taken to the hospital Friday night after his family's PIT BULL attacked him. The boy was playing with the dog, a 1-year-old male, at his home two blocks east of Beech Daly on Lehigh when the dog turned and bit the right side of his face. According to the boy's mother, the attack was unprovoked. The boy was taken to Annapolis Hospital for treatment. The mother said the dog was up to date on its paperwork, but did not provide it to police. The dog was left with the family. Tuesday - June 26, 2012 - About 3 pm Saturday, a 9-year-old girl was walking with her father to the mail box when a loose Pit Bull suddenly lunged at the girl. The dog bit her arm and her father grabbed it in an attempt to free his daughter from the Pit Bull's mouth. The dog then turned on him and bit him on the leg and the hand. They were both treated at a local hospital. Animal control and police officers searched the neighborhood but as of Monday they still could not find the all-white Pit Bull Mix. The Hollister Police Department is asking anyone who sees the dog to immediately call Animal Control. NO CHILDREN IN THE AREA ARE HURT !!! DELVIN WILLIAMS THEN PUNCHED THE VICTIM TWICE IN THE FACE AND SHOVED HIM OFF OF THE PORCH CAUSING HIM TO HIT HIS HEAD ON THE CONCRETE PAVEMENT. POLICE FOUND THE MAN IN THE FRONT YARD WITH BLOOD GUSHING FROM HIS HEAD. HE WAS TAKEN TO ST. ELIZABETH HEALTH CENTER FOR TREATMENT AND WAS LISTED IN STABLE CONDITION MONDAY. THE PIT NUTTER WAS FOUND AT HIS HOME AND ARRESTED ON A FELONIOUS ASSAULT CHARGE AND FOR TWO WARRANTS --ONE FOR FAILURE TO PAY CHILD SUPPORT AND ANOTHER FOR FAILING TO APPEAR IN COURT ON A TRAFFIC VIOLATION. SHARPSBURG MD - MAN LOSES SUIT OVER NEIGHBOR'S PIT BULLS KILLING HIS BELOVED LAB "BUDDY" - BUT JUDGE SAYS HE PROVED HIS CASE BUT JUST DIDN'T STATE THE FAIR MARKET VALUE OF BUDDY !!!!!!!!!!! Monday - June 25, 2012 - Terry Porter left the court room on Thursday believing a judge had ruled in his favor in a civil lawsuit against a neighbor whose Pit Bulls he claimed killed his black Labrador Retriever, Buddy, last year. Even the neighbor's attorney thought Porter had won. But a few hours later Porter learned the judgement was in favor of the defendent, DENESA CHURCHEY. "THE FAIR MARKET VALUE OF BUDDY !!!!!!!!!!!!!!!!!!!!!!" "PIT BULLS AGGRESSIVE ANIMALS BRED TO FIGHT". 'WAS NO REASON FOR CHURCHEY'S DOGS TO MAUL YOUR DOG'. 'CATEGORY OF UNDOMESTICATED WILD ANIMALS'. PIT BULLS ARE NOW CONSIDERED TO BE DANGEROUS. Although he ruled in Churchey's favor, Judge Thomas told Porter he proved his case by a preponderance of the evidence. Unlike a criminal case, which requires a judge or jury to find guilt beyond a reasonable doubt, a judge in a civil case only has to find that the evidence is weighted more to one party than another. Monday - June 25, 2012 - A woman was walking her dog Saturday on Pan Am Lane when a NEIGHBOR'S PIT BULL ran toward them and attacked her dog and killed it. The Pit Bull's owner, Jean Paul Bourgeois, was arrested and issued a summons to appear in court in September. St. Mary Parish Sheriff's office said he was charged with animal running at large. 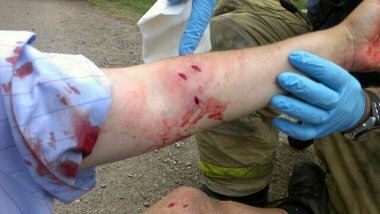 Friday - June 22, 2012 - A dog owner in DeKalb County was forced to shoot a dog attacking their dog on Friday. It happened on Swallow Lane, just off Covington highway. A Pit Bull was being walked on a leash and pulled away from its owner and began attacking another dog. The owner of the dog being attacked shot the Pit Bull in the head. The Pit Bull was taken to a vet and its condition is not known at this time. Police have not said if any charges will be filed. LEBANON PA - A PIT BULL ATTACKED A WOMAN'S PET DOG AS SHE WAS WALKING IT - LYING PIT NUTTER LEFT WITHOUT HELPING HER AND HER DYING DOG !!! Friday - June 22, 2012 - Police responded early Monday morning to a dog complaint on the 500 block of Oak Street. A woman was walking her dog and was attacked by another dog she described as a brown Pit Bull. Her dog was killed by the Pit Bull. She told Police that the owner of the Pit Bull at first stopped to help her but then left telling her that he was going to put his dog up in his house and come back to help her. He never returned. The man is described as a heavyset, Hispanic male with short brown hair. He looked to be between 29 and 39 years old. Police believe the man and his dog live in the area of Oak Street. Anyone with information on this incident is asked to contact Lebanon City Police at 717-272-6611. 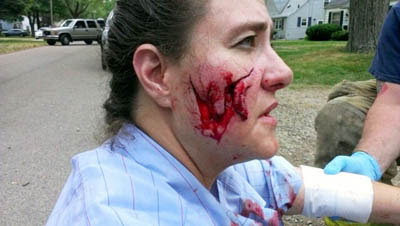 Thursday - June 21, 2012 - A pack of 4 PIT BULLS attacked 2 women walking their dogs in separate incidents. Vickie Lowe and her pet Corgi/Beagle were attacked shortly before 8am on Wednesday in front of her condominium in the 900 block of Marine Street on Galveston's East side. Minutes later, the same pack of dogs attacked Storm, a 40-pound miniature Husky and her owner, Sofia Morffe, behind the condominium. Both the women suffered bites and scratches trying to protect their dogs. Storm was the most seriously injured and needed surgury to repair her wounds. "THE DOGS WEREN'T AGGRESSIVE TO THE OFFICERS AND EVEN ROLLED ONTO THEIR BACKS ALLOWING THEM TO PUT LEASHES ON THEM AND PUT THEM IN A TRUCK." "AT FIRST THEY WERE WAGGING THEIR TAILS AND THAT LOOKED STRANGE. THEN THEY CIRCLED STORM...ONE WENT FOR HER THROAT AND ANOTHER GRABBED HER FROM BEHIND. SHE TRIED TO FIGHT THEM OFF FOR A LITTLE WHILE BUT THEY GOT HER DOWN." The dogs had on no collars, tags or microchips. One did have on a large chain leash around its neck. The search for the owner continues. DENISON TX - A NEIGHBOR HEARS YOUNG CHILD SCREAMING IN YARD NEXT DOOR - SHE LOOKS OUT TO SEE A LARGE PIT BULL STANDING OVER THE CHILD !!! Thursday - June 21, 2012 - A woman came home from work this morning and she began hearing screams. She looked out her kitchen window and saw a PIT BULL on top of a baby. She said the child was crouched down like a little turtle. She ran outside and started screaming at the dog. The dog walked away from the child, then turned and came back and flipped the child back over and grabbed a hold of his head. Realizing the young child was unattended, she did all she knew to do....she began banging on the walls and window of the child's home trying to get someone to come outside. Finally somebody came out and she saw blood and scratches on the child and she called the Police. When officers arrived they discovered the child was hurt and he was transported to Texoma Medical Center. The child's mother, 24-year-old Amanda Densel, was arrested on charges of abandoning and endangering a child. * "THE WHOLE SITUATION HAS BEEN BLOWN OUT OF PROPORTION." * "THE DOG WOULD NEVER HURT THEIR CHILDREN." * "THE ONLY TIME THAT DOG HAS EVER BEEN MEAN IS WHEN SOMEONE TRIED TO GET NEAR THE KIDS." ELECTRIC FENCE AND THE DOG WAS WEARING AN ELECTRIC COLLAR!!!! The boys uncle, Annapolis Police officer Brian Antal, said Wednesday that doctors realized the injuries were more serious than originally thought. They had to repair an artery in the child's left leg and another surgery is needed. It appears that the Pit Bull had attacked people twice before. Animal Control has taken custody and the incident remains under investigation. Wednesday - June 20, 2012 - Sue Taylor took her dog CASSIE, a Pit Bull Shepherd Mix, out early Sunday morning and it was attacked by the NEIGHBOR'S PIT BULL and injured so severely it had to be put down. THIS IS THE SECOND TIME IN 6 MONTHS THAT ONE OF TAYLOR'S DOGS HAS BEEN FATALLY ATTACKED BY THE SAME PIT BULL. IN DECEMBER HER 9-YEAR-OLD DOG WAS ATTACKED AND HAD TO BE PUT TO SLEEP ALSO. SHE SAYS THAT BOTH HER DOGS WERE LOVABLE AND HAD NEVER BOTHERED ANYONE. Last year the Pit Bull attacked and killed a dog across the street and a neighbor was injured as well. The dog was put in quarantine and then returned to its owner. There have been 3 incidents now and it's been reported. OVER THE WEEKEND NEIGHBORS SAID THE DOG'S OWNER PASSED OUT AND HER DOOR WAS OPEN. THEY SAID SHE'S NEVER HOME AND OFTEN KEEPS THE DOG LOCKED UP ALL DAY LONG. TAYLOR WANTS THE PIT BULL'S OWNER HELD RESPONSIBLE AND THE DOG LOCKED UP. BRISTOL POLICE ARE INVESTIGATING. Wednesday - June 20, 2012 - On JUNE 12, Lindsey Parnell and her 2 rescued Greyhounds went to her mother's house to get her 5-year-old daughter. Her mother runs a private day care from her home and Parnell's daughter gets off the bus there after school. She had her greyhound BABEE, by her side on a leash when a PIT BULL MIX came into the yard and grabbed Babee on the back and began shaking. The Pit Bull Mix bit into his back first and then began biting each of his legs. Parnell kicked the dog and got in between her dog and the attacking dog and it bit her on the thigh. Somehow they got the attack stopped and Parnell rushed her severely injured pet to the vet. HIS FAMILY HAD ADOPTED THE MIXED BREED DOG FROM SHAID ON JUNE 9. IT HAD SHOWN NO AGGRESSION AND ESCAPED THE HOUSE WHEN THE SON'S FRIEND OPENED THE DOOR. THE DOG WAS RETURNED TO THE SHELTER THE FOLLOWING DAY. THEY HAD BEEN TOLD THE 2-YEAR-OLD PIT BULL MIX WAS PICKED UP RUNNING FREE IN THE SPRINGFIELD AREA BY ANIMAL CONTROL. HE WAS TOLD BY SHAID THAT THE DOG HAD SHOWN NO SIGNS OF AGGRESSION AND HE SAW IT INTERACT WITH CATS AND OTHER DOGS BEFORE ADOPTING IT. "HE WAS ASSESSED BY A TRAINER BEFORE BEING ADMITTED TO SHAID ABOUT 6 WEEKS AGO. HE LOVES PEOPLE. HE WANTED TO BE A LAP DOG." Tuesday - June 19, 2012 - A PIT BULL NAMED BEYONCE will be put down after it got into a neighbor's yard this morning about 10:00 am and began attacking the neighbor's Labrador and Cat and the homeowner shot it. The homeowner claimed he was protecting his animals and his property. The shot broke the Pit Bull's back and he will have to be put down. The homeowner will not be charged. Tuesday - June 19, 2012 - Two loose Pit Bulls ran onto a playground at P.J. Hill Elementary School Sunday afternoon. chasing two boys. One of the PIT BULLS bit one of the boys, and then both boys, ages 13 and 15, climbed up a tree to escape the dogs. Sgt. Tony Manzo and Officer Nelson Cartegena arrived, and standing behind a fence on the school property, saw the dogs aggresssively trying to get the boys. They began yelling at them to distract them, and the animals ran to the fence and tried to get to the officers. they shot one of the dogs twice killing it and the second dog ran away. It was later caught by Animal control. There is an investigation to determine if the dogs' owner is registered. MEMPHIS TN - 2 PIT BULLS AND 1 ROTTWEILER RUN LOOSE AND ATTACKED 2 WOMEN IN SEPARATE INCIDENTS - HERO - A PASSERBY SAVED THE LAST WOMAN BY PULLING HER UP INTO HIS TRUCK !!! On Tuesday, June 12, 2012, Two women in the Whitehaven area were viciously attacked by 2 Pit Bulls and 1 Rottweiler running loose. First, a 54-year-old female victim was attacked. Police arrived and the woman was taken to MED in critical condition. While investigating this scene, officers were advised that a second victim, a 38-year-old woman, was in the area of Faronia and Mayhill when 3 dogs attacked her as she was getting off a bus. ****HERO**** A passerby witnessed this last attack and started blowing his horn and he stopped and another witness said that this GOOD SAMARITAN literally scooped this woman up off the ground from his car and got her in his car and took her to the hospital. THEY DENIED OWNING 3 DOGS AND ONLY ADMITTED TO OWNING 2. THEY REFUSED TO TURN OVER THE THIRD DOG TO OFFICERS. A SEARCH WARRANT WAS ISSUED AND THE 3RD DOG WAS LOCATED IN THE ATTIC. ALL 3 DOGS WERE RECOVERED BY THE MEMPHIS ANIMAL SHELTER. BOTH WERE CITED FOR VICIOUS DOGS AND DOGS RUNNING LOOSE. BOTH WERE ALSO CHARGED BY MEMPHIS POLICE WITH "FALSE REPORTING". AS MANY AS 400 PIT BULLS IN THIS HOUSING PROJECT ----GIRL'S BROTHER SAYS THE PIT BULL WAS ON A LEASH HELD BY THE MAN AND HE TRIED TO PULL IT AWAY FROM HIS SISTER BUT THE DOG WOULD NOT LISTEN. IT APPEARS THAT NEIGHBORS KNEW THE YOUNG MEN KEPT PIT BULLS !!! UPDATE: Neighbors say the 2 adult brothers took care of the 2 PIT BULLS in the Public New York City Housing Projects in Harlem. However, on May 1, 2009, Authorities banned Pit Bulls, Rottweilers, German Shepherds, Doberman Pinchers, and any dog that weighs over 25 pounds from living in the housing project. Monday - June 18, 2012 - VIDEO - A 6-year-old girl was standing in an elevator this afternoon sipping an Icee when a person with 2 PIT BULLS was waiting on the elevator. One of the Pit Bulls bit the girl's arm. She was taken to Harlem Hospital in serious but stable condition. Officers carried 2 Pit Bulls from the building located at 135th Street and Madison Avenue. They also led away 2 men in hand cuffs - presumably the dog's owners. It is not known yet if they are facing any charges. BREAK IN TWO PLACES !!!!!!!!!! The child's mother and father are estranged and her mother, Chelsea Lawson-Walker, wants him charged with child endangerment. The dog was not up to date on its vaccinations and was surrendered by its owner and put down. SOMEONE RAMMED A MOVING CAR INTO THE ATTACKING PIT IN ORDER TO GET IT TO RELEASE THE VICTIM. IT HAD NEVER GONE VICIOUS TOWARD ANYONE BEFORE. THE MAN'S WIFE GOT A SHOVEL AND WAS HITTING IT AND IT STILL WOULDN'T LET GO!.. Sunday - June 17, 2012 - A man, age 55, was walking his own dog near 42nd Street and Capitol Drive Saturday when a PIT BULL LEAPT FROM A SECOND STORY BALCONY and attacked both the man and his dog before Milwaukee Officers were able to shoot it twice with a shotgun. The man was taken to St. Joseph's Hospital with serious wounds and required surgery. He had wounds to his face, ear, arms, underarm, legs and torso. Officers are still trying to find the Pit Bull's owner and an investigation into the attack is ongoing. CELEBRITY MUSIC MANAGER GLENN WHEATLEY, 64, WAS WALKING HIS SON'S DOG IN SIDNEY WHEN AN AMERICAN PIT BULL/MASTIFF MIX LUNGED AT THE LITTLE DOG, DANKO, AND WHEATLEY INTERVENED, TRYING TO SAVE THE FAMILY PET. THE LARGE DOG BIT OFF PART OF HIS MIDDLE FINGER. HE SPENT SEVERAL DAYS IN THE HOSPITAL BUT HAS NOT COMMENTED ON THE INCIDENT YET. Eight-Year-old YMANNI WRIGHT was badly mauled on May 23 by a PIT BULL in the Old Hill neighborhood. She endured hours of surgery at Baystate Medical Center and needed more than 400 stitches to close wounds on her arms and legs. "IT LOOKED LIKE SHE HAD BEEN ATTACKED BY SHARKS," HER MOTHER SAID. Baystate surgeons have told the family that Ymanni suffered permanent damage to her right arm and will require additional surgeries and skin grafts in the years ahead. Her mother, Bianca Rodriguez, said she is fearful the dog is going to attack again and she wanted people to beware of it. "THAT PIT BULL CAME UP OUT OF NOWHERE AND ATTACKED HER." BIANCO RODRIGUEZ SAYS: "I DON'T UNDERSTAND WHY PEOPLE KEEP PIT BULLS. WE HEAR ABOUT PIT BULL ATTACKS OVER AND OVER AND OVER AND OVER AND PEOPLE KEEP BUYING THEM." LIONS, TIGERS, LEOPARDS, PANTHERS, BEARS, WOLVES, APES, GORILLAS, FOXES, ELEPHANTS, ALLIGATORS, CROCODILES AND SNAKES, WHICH ARE VENOMOUS OR PRESENT A RISK, SUCH AS BOA CONSTRICTORS AND ALL MEMBERS OF THE PYTHIONIDAE FAMILY THAT EXCEED 6 FEET IN LENGTH, AND MONKEYS OF A SPECIES WHOSE AVERAGE WEIGHT IS 20 POUNDS OR MORE. * any mammal, amphibian, fish, reptile or fowl, which is of a species, which, due to size, vicious nature or other characteristics, would constitute a danger to human life, physical well-being or property. * any dog or cat, which has a disposition to attack or bite any person or domesticated animal without provocation, has been trained for fighting or is kept primarily for the purpose of fighting. Incident reports and written complaints taken by an animal control officer or police officer will serve as evidence the animal is considered dangerous. * any dog which, habitually charges at persons or other domesticated animals on the public streets, public ways, or other properties. * any domesticated dog that has, in its known genetic history and/or formal pedigree crosssbreeding with the wolf species, including wolf hybrids, wolf-mix breeds and the breed known as Tundra Shepherd. * any pit bull terrier or bullmastiff, which is defined as any American Pit Bull Terrier, Staffordshire bull Terrier, American Staffordshire Terrier, Bullmastiff, or other like subset of those breeds, or any mixed breed of dog which contains, as an element of its breeding, those breeds so as to be identifiably of those breeds. * any animal, which is not naturally tame and gentle, but is of a wild nature of disposition and, because of its size, vicious nature or other characteristics, would constitute a danger to human life or property. * to let the animal off of the property where its owner resides unless the animal is with the owner and on a leash or kept under "orderly control." * to keep animals which are considered "noisy," by means of barking, howling, yelping, roaring, bellowing and other audible noises sufficient to annoy or disturb neighboring residents. * an injury or damage was sustained by a person while committing a willful trespass or other tort upon the premises occupied by the owner or keeper of the dog; while teasing, tormenting, abusing or assaulting the dog; or while committing or attempting to commit a crime upon the premises where the dog resides. * an injury or damage was sustained by another animal while the other animal was upon the premises where the dog, alleged to be dangerous, is kept. * the dog was protecting or defending a person within the immediate vicinity of the dog from an unjustified attack or assault. * an injury to a domestic animal was sustained while the dog was working as a hunting dog, herding dog, or predator control dog on the property or under the control of its owner or keeper and the damage or injury was to a species or type of animal appropriate to the work of the dog. * the dog was responding to pain or injury inflicted upon it by the person or other animal who sustains injury or damage. If a Rainsville resident owns what is considered to be a dangerous animal, the ordinance calls for several mandatory requirements, including confinement indoors or outdoors with specific guidelines using a leash, muzzle or crate, posting. signs, getting liability insurance, have identification photographs, report incidents within 10 days to authorities and must register all offspring of dangerous dogs within six weeks of birth. The owners must also obtain, through an application process, a permit to keep a dangerous animal on their premises. Permits can be revoked or suspended. If a resident is in violation of the ordinance, the matter will first be investigated, the owner may be asked to remove the animal from the premises and will be given five days to do so. If the animal has previously caused harm, authorities can immediately "seize and impound" the animal or the animal can be killed, if "seizure or impoundment are not possible without risk or serious, physical harm or death to any person." The ordinance does not allow animals within the corporate boundaries or police jurisdiction of the city except to zoos, "bona fide" educational or medical institutions , museums, circuses, carnivals, other exhibits or competitions, a "bona fide" veterinary hospital or clinic, commercial establishments possessing such animals for the purpose of sale or display, private individuals who have registered a dog meeting the definition of "dangerous animal" and have complied with all applicable requirements of the ordinance, a humane society or animal shelter under contract with the city or county or a law enforcement agency or officer, which maintains an animal trained and certified to assist in law enforcement. In some cases, those exempt may still be required to obtain a permit and register the animals. The penalty for violating the ordinance's "noisy animal" section will be fined no more that $250 or imprisoned for no more than 30 days in the county jail. Those who violate any other section of the ordinance can be fined up to $500 or no more than 60 days in the county jail. BASICALLY THE ORDINANCE IS TELLING OWNERS TO REGISTER THEIR ANIMAL AND KEEP IT IN A SAFE ENCLOSURE OR SAFELY DETAINED. "IT'S FOR ALL ANIMALS, ESPECIALLY DOGS," CARROLL SAID. "I THINK IT WAS NECESSARY AND SO DID THE COUNCIL, BECAUSE THEY VOTED FOR IT. THIS IS THE LEAST RESTRICTIVE MEANS TO PROTECT THE PUBLIC, WHILE ALLOWING PEOPLE TO ENJOY THEIR PETS." ONLY ONE DOG KILLED THE CHILD IDENTIFIED AS TYZHEL LATELLA MCWILLIAMS -THE OTHER TWO MALE PIT BULLS WERE RETURNED TO THE HOME !!!!!!!!!!!!!!!!!!!!!!!!! Friday - June 15, 2012 - An 8-month-old boy was mauled and killed by up to 3 PIT BULLS Thursday evening just before 5 pm on the 3000 block of West Street in Lemon Grove The child died after being transported to Rady Children's Hospital. Authorities confirm that 3 Pit Bulls were hauled away at the scene by Animal Control. MORE INFORMATION AND PICTURES OF THE DOGS. Friday - June 15, 2012 - Two men were walking along in their Albuquerque neighborhood Thursday afternoon as they often do. They were just a few hundred feet from their home when they heard the 2 AMERICAN BULLDOGS coming - breathing and paws clicking on the driveway. Witnesses said that the female dog did not get so aggressive but the male latched on to one of the men biting him on his shoulders, head, arms and legs. The 2 men ran to get on top of a car for safety, but the dogs followed them on top the car. They then ran to a larger Lincoln Navigator. They broke the windshield and left blood scattered on both vehicles. A neighbor heard the screaming and called 911. The dogs had the 2 men surrounded on the vehicle circling it and the male was too aggressive for anyone to help. When officers arrived about 10 minutes later, the male dog charged one of the officers and he shot the dog 5 times. The female dog was in heat and was taken by Animal Control to the Westside Animal Shelter. The owners will likely be cited for the dogs being loose, NOT REGISTERED TO BE BRED, and being aggressive. LAWRENCEVILLE GA - O.K. YA'LL - LET'S ENJOY SOME PIT BULL DRAMA - NO MAULINGS OR KILLINGS OF HUMANS IN THIS CASE...YET!!! 1ST PIT NUTTER'S PIT BULL ATTACKED ANOTHER DOG IN THE HOME. SHE'S DESPERATE TO GET HER POOR "SWEET BABY LIKE MY OWN CHILD" ATTACKING PITTIE SOME HELP. 1ST PIT NUTTER DOES NOT EVEN GO INTO THE 2ND PIT NUTTER'S HOUSE...SHE JUST CARRIED HER SWEET BABY SHE LOVES LIKE A CHILD OVER THERE AND LEFT IT....IF SHE HAD GONE INSIDE SHE MIGHT HAVE NOTICED THAT THEIR UTILITIES WERE TURNED OFF AND THEY WERE BEING EVICTED. "SHE'S MY BABY. EVERYTHING TO MY HUSBAND AND I WE JUST WANTED TO FIND SOMEONE TO HELP STELLA WORK THROUGH HER ISSUES !!!" DAYS AFTER DROPPING HER "CHILD" OFF TO THIS TOTAL STRANGER SHE WAS TOLD THEY HAD GIVEN STELLA AWAY --- TO A SISTER IN ALABAMA. BUT EVENTUALLY BROOKE BROVICH ADMITTED THAT HER HUSBAND HAD COME OUT THE DOOR ONE MORNING AND STELLA HAD RUN RIGHT BETWEEN HIS LEGS AND TOOK OFF. SHE SAYS HE GOT INTO HIS CAR AND CHASED HER BUT DIDN'T CATCH THE DOG. Gwinnett County authorities are investigating and Elizabeth Ingram is handing out flyers and is offering $1,000 reward to get Stella back. COMMENT: FRANKLY, I DON'T BELIEVE A WORD EITHER ONE OF THEM SAYS. BUT I BELIEVE THIS - PIT NUTTER #1 WILL GO TO THE SHELTER AND ADOPT HER ANOTHER "SWEET BABY" TO LOVE LIKE HER CHILD, AND PIT NUTTER #2 WILL LAND SOMEWHERE ELSE AND TRAIN HER A WHOLE BUNCH OF RESCUED PITTIES. THEY ARE "RESPONSIBLE PIT BULL OWNERS." Thursday - June 14, 2012 - The Pleasants County Sheriff's Department is investigating the tragic death of 2-year-old JACK REDIN who was killed Wednesday in St. Marys when he wandered into a neighbor's yard and was attacked by 2 PIT BULL MIXES. The breed of the dog was changed to Mixed Breed Dogs. Everyone saw the first articles that came out where first responders said they were Pit Bull Mixes. Then after the first day the dogs were called Mixed Breed. Even with this change Pit Bulls were responsible for 61% of the deaths by dogs in 2012. THE NEIGHBOR SAYS THE DOGS ARE OWNED BY HIS BROTHER BUT HE HAD INSTALLED AN INVISIBLE ELECTRIC FENCE TO KEEP THEM IN BUT IT WOULD NOT KEEP A CHILD FROM STEPPING INTO THE YARD. Witnesses say Jack and his siblings had been playing in the family's yard most of the day when Jack disappeared. Family members and neighbors began looking around the property and Jack's father made the gruesome discovery. LONNIE REDIN PICKED UP HIS SON AND WRAPPED HIM IN A BLANKET AND HELD HIM ON A PORCH SWING WHILE HE TRIED TO COME TO GRIPS WITH WHAT HAD JUST HAPPENED. THE DOGS HAD BEEN CONFINED BY AN ELECTRIC FENCE BURIED BENEATH THE PROPERTY LINE BUT THERE WAS NO BARRIER TO KEEP THE YOUNG CHILD FROM WANDERING INTO THE DOGS' YARD. Wednesday - June 13, 2012 - A Pit Bull was shot and killed by Rochester Police this afternoon on Seward Street on the city's southwest side. A group of young boys were walking down the street and 2 PIT BULLS started chasing them. Some of them made it to their home and ran inside and the Pit Bulls came up to the door of the home. Two of the boys were bitten - one on the hip area and the other on his hand. A witness said that..........THE OFFICER JUMPED UP ON THE HOOD OF A CAR AND ANIMAL CONTROL WAS TAKING A LONG TIME TO GET THERE AND THE PIT BULL WAS RUNNING AROUND AND BEGAN TRYING TO JUMP UP ON THE HOOD.....SO HE HAD TO SHOOT IT. The second Pit Bull was taken away by animal control. and they are trying to find out who the owner is. According to Police, this is a very busy neighborhood, full of kids and families. It's a type of community where dogs should not be running loose......ANIMAL CONTROL PUT DOWN 3 PIT BULLS JUST DAYS AGO AFTER AN INCIDENT WHERE THE PIT BULLS ATTACKED 2 GREYHOUNDS BEING WALKED ON LEASHES BY THEIR OWNER. ONE OF THE GREYHOUNDS DIED FROM THAT ATTACK. JAMES SEROR of Tory Hill Road was mauled by 2 PIT BULLS after they got loose Tuesday afternoon according to Dan Gifford, the town animal control officer. Seror was taken to Albany Medical Center Hospital for treatment of more than 199 bites. He is in critical condition in the intensive care unit. HE SAID THERE HAVE BEEN THREE PREVIOUS CALLS TO THE HOME FOR PROBLEMS WITH DOGS. MARBOT WILL HOLD A HEARING FRIDAY AFTERNOON TO DETERMINE THE DOGS' FUTURE. THAT LASTED UP TO 20 MINUTES !!!!! The 44-year-old aunt was also bitten after she threw herself on top of the boy in an attempt to shield him. Frankie's aunt had adopted the Pit Bull from "Out of The Pits Rescue" earlier. Frankie's injuries were extremely severe. He had 4 sections of his head removed down to the skull. Donated skin was put on his head. His right cheek was removed leaving him with missing nerves and glands. His left cheek was ripped open. Skin from his leg was used on his forehead and head. His eye has been "lifted" a few times in surgery. His hand had to be sewn together leaving him with no feeling in his pointer finger. Balloons have to be placed in his head to stretch the scalp to remove the bald spots. He was left with hearing loss. THE NEWS CONFERENCE IS HELD IN SUPPORT OF SENATOR NEIL D. BRESLINS (D-DELMAR) PROPOSED S.1191 - AN ACT TO AMEND THE GENERAL OBLIGATIONS LAW IN RELATION TO LIABILITY OF OWNERS FOR DOG BITES. NEW YORK STATE IS A "ONE-BITE STATE," WHICH MEANS THE OWNER CANNOT BE HELD RESPONSIBLE FOR THE DOG'S FIRST BITE OR INJURY TO ANOTHER, UNLESS THE OWNER WAS NEGLIGENT IN HIS ACTIONS TO CONTROL THE DOG OR IF THE DOG IS KNOWN TO BE DANGEROUS. HE KNEW THE DOG VERY WELL AND HAD BEEN IN AND OUT OF THE HOUSE A THOUSAND TIMES FOR SEVERAL YEARS. But on that day the dog suddenly lunged at the boy biting his face. The friend's father was nearby when it happened and saw the attack and said the boy did nothing to provoke the dog. He surrendered the dog to be put down. PITTSFIELD MA - PIT BULLS ATTACKED A 9-YEAR-OLD BOY GOING INTO HIS APARTMENT WITH HIS MOTHER - THEY DRAGGED HIM INTO THE YARD - BITING HIS FACE, HEAD AND SCALP!!! Nine-year-old Perrin Petell was attacked by at least 2 of 3 PIT BULLS as his mother was opening up the door to get into their apartment. When the dogs came down the stairs they pinned the boy against the door and then dragged him out onto the lawn and began mauling him. He received over 30 puncture wounds to his face and head and part of his scalp was torn off. He was transported to Berkshire Medical Center. Neighbors say this isn't the first time that these dogs have attacked - Cats have been killed and a woman was attacked a few years ago. The owners are Adam Pollock and Lori Rohle, both age 42. An investigation is under way and all 3 dogs have been taken by the animal shelter. GREENVILLE NC - RECENTLY ACQUIRED PIT BULL ATTACKED 2 WOMEN LATCHING ONTO THEIR UPPER BODY AND DANGLING ITS FEET - IT'S BEEN TRYING TO ATTACK NEIGHBORS FOR DAYS - "THEY JUST BROUGHT IT FROM ANOTHER CITY WHERE IT ATTACKED SOMEBODY ELSE"
Tuesday - June 12, 2012 - Two women were taken to the hospital after a PIT BULL attacked them on Tuesday on Farmville Boulevard. A neighbor, Larry Clemons says he was inside his house when he heard a woman screaming about 10:30 am. He said he saw the Pit Bull attacking the woman in the roadway. "I SAW THE DOG JUMP UP GOING FOR HER NECK AND IT LATCHED ON TO HER CHEST NEAR HER NECK AND ITS FEET WAS JUST HANGING THERE DANGLING FROM HER." Lanes of traffic were blocked and people wanted to get out of their cars to help the women but were to scared to get out of their cars. Larry Clemons and another neighbor rushed out to help and began hitting the dog with brooms and other objects trying to break its hold. When the woman would try to get away, the dog would just latch onto her again. Portia Williams got in her car and backed out into the roadway and began blowing her horn at the dog. The victim eventually broke free and got in the car with her and they went to the hospital. As they drove away they could see the other woman lying on the ground. She was also injured on her upper chest, arm and leg. She was taken by ambulance to a hospital. "THE OWNERS LIVE IN A HOUSE NEARBY AND THEY JUST BROUGHT THAT DOG FROM ANOTHER CITY WHERE HE ATTACKED SOMEBODY ELSE. THE DOG IS TOO VICIOUS TO BE OUT HERE ON THE STREET." UPDATE: ON THURSDAY THE VICTIM IS STILL IN THE HOSPITAL - RESIDENTS SAY THE DOGS HAD BEEN RUNNING LOOSE BEFORE AND HAD THREATENED THEM AND THEY HAD CALLED ANIMAL CONTROL. Tuesday - June 12, 2012 - VIDEO - A 74-year-old man, SAWNEY BELL, was attacked by 2 dogs on his walk to work this morning. The guard dogs escaped from a fenced-in area at Towing Pros and Recovery. During the attack a neighbor heard his own dog barking and looked outside to see 2 other dogs dragging something. At first he thought it was a dead animal, until he heard the victim screaming. Two other neighbors came with a shovel and a bat and authorities finally cornered the dogs in an alley. AND THEIR OWNER WILL RECEIVE A CITATION FOR $50 !!!!!!! AND A BROKEN ARM !!!!! MY COMMENT: AND THIS IS USUALLY WHERE SOMEONE TELLS THE REPORTER THAT THE INJURIES ARE................IN MY OPINION... ANY TIME A 74-YEAR-OLD HUMAN GETS MAULED BY 2 VERY LARGE DOGS LIKE THIS POOR MAN DID, IT WILL BE LIFE ALTERING AND LIFE THREATENING !!!!!!!!!!!!!!!!! Tuesday - June 12, 2012 - A 5-year-old Calgary girl was treated in hospital after being attacked by 2 dogs on Sunday. The 2 HUSKIES were not on leash or with their owner when they approached the girl while she and her brother were walking to a nearby park in Silver Springs in the city's northwest. BILL BRUCE, the city's director of animal and bylaw services, says a bystander stopped the attack. "PROBABLY ONE DOG DID THE ACTUAL BITE, GRABBED HER BY THE NECK, PULLED HER DOWN." The girl was taken to Alberta Children's Hospital suffering from a number of bites. Both dogs are in custody and the owner has been located and will be meeting with bylaw officials on Monday to decide what will be done with them. BILL BRUCE states charges will be laid in any case. The girl's stepdad wants the animals destroyed and the owners charged. UPDATE: ULTIMATE PIT NUTTERY !!!!!!!!!!!!!!!!! Tuesday - June 12, 2012 - A 13-year-old girl in glendora is recovering after being attacked by one of the FAMILY'S PIT BULLS. The attack happened on the 900 block of East Myrtle Avenue at about 12:30 am. The girl was with her 10-year-old and 1-year-old brothers. The family has 2 Pit Bulls. ANOTHER OFFICER RAN THE ANIMAL OVER WITH HIS CAR, FEARING IT WAS A THREAT TO OTHER. The second Pit Bull was taken away by Animal Services. Officials report that someone cut through a fence at the shelter and pried open the doors on two kennels to take the dogs - MAX, A ROTTWEILER AND WHITNEY, A PIT BULL. They have been declared dangerous and were scheduled to be euthanized Friday. The shelter director, Amy Hanson, says it is a huge concern. The dogs attacked and killed 8 of Greg Welsh's Alpacas He says he is very concerned that the dogs have been stolen. One of his Alpacas that did live had both of its ears bitten off. Welsh says he has no doubt that the dogs would attack people. Lewis County deputies are on the lookout for the dogs and --THEIR OWNER. MEMPHIS TN - NEIGHBOR'S PIT BULL NAMED "CANNIBAL" ON A BIG OLE CHAIN ATTACKED A 2-YEAR-OLD BOY - HE IS IN CRITICAL CONDITION WITH HIS FACE "RIPPED OFF"
"SOMETHING BOUND TO HAPPEN, SOMETHING BOUND TO HAPPEN.."
Sunday - June 10, 2012 - A toddler remains in critical condition at Le Bonheur Children's Hospital after he was attacked by his neighbor's PIT BULL NAMED "CANNIBAL". "IT WAS INDESCRIBABLE. THE CHILD WAS UNRECOGNIZABLE !!! THE SKIN ON HIS FACE WAS RIPPED OFF AND WE COULD SEE HIS BONES. HIS DAD WAS HOLLERING . HIS BREATH WAS GETTING SHORT AND HIS EYES WAS ROLLING BACK IN HIS HEAD." "TAUNTED CANNIBLE WITH A STICK FOR UP TO 45 MINUTES. AND THIS ISN'T THE FIRST TIME THE CHILD HAS TRIED TO PLAY WITH THEIR PIT BULLS........2 WEEKS AGO HE WANDERED OVER AND CRACKED OPEN A CRATE OF PUT BULL PUPPIES." COMMENT: JUST WATCH THE VIDEO, PEOPLE, AND YOU TELL ME.....WHAT'S WRONG WITH THIS PICTURE ??????!!!!!! PORTSMOUTH OH - NEIGHBOR'S PIT BULL BITES A 3-YEAR-OLD GIRL'S FACE - ALMOST BIT HER NOSE OFF !!!!! A 3-year-old Wayne Hills girl, Madasyn McAllister, is recovering from a PIT BULL attack to her face on June 3. She was outside playing when the Pit Bull almost bit her nose off. She was hospitalized at Southern Ohio Medical Center and the hospital contacted the Portsmouth Health Department and an investigation began. The owner of the black and white dog is listed as JOE COLLINS. The director of Environmental Health at the Health Department says they are attempting to locate him. The child's family states that the same Pit Bull also bit another child in their family 2 months ago, but the Health Department has not been able to confirm this. Portsmouth City Council passed a vicious dog ordinance in may that would regulate dogs such as this. It defines "Vicious Dogs" as having a habit of biting at children or other people, or that has a propensity, tendency or disposition to attack, cause injury or other wise endanger the safety of people or other animals. If the owner does not comply with the stipulations of the ordinance the owner is subject to a misdemeanor charge, the severity of which depends on the number of violations the owner incurs. "UNLESS IT'S SOMETHING SEVERE, ON THE FIRST OFFENSE WE WILL GIVE THE OWNER A COPY OF THE ORDINANCE AND EDUCATE THEM ON HOW YOU ARE SUPPOSED TO CONFINE YOUR DOG. IF WE FIND IT NOT CONFINED THAT WAY AGAIN WE COULD POSSIBLY ISSUE A CITATION." GALVESTON TX - JANIE MARSHALL AND HER BELOVED "BELLA" WERE ATTACKED BY A PIT BULL - UNABLE TO PUT THE NIGHTMARE BEHIND HER - SHE IS NOW STRUCK BY THE FACT THAT "NEARLY EVERYBODY SHE TALKS TO HAS A STORY ABOUT A PIT BULL!!!" JANIE MARSHALL'S 20-POUND SPANIEL AND RETRIEVER MIX SURVIVED AN ATTACK BY A PIT BULL ON MAY 23 IN GALVESTON WHILE TAKING THEIR DAILY WALK ALONG AVENUE M NEAR 25TH STREET. "OUT OF NOWHERE" A PIT BULL HAD BELLA BY THE THROAT. THE PIT BULL TRIED TO DRAG BELLA UNDER A PORCH. JANIE HAD NO WEAPON SO SHE BEAT THE PIT BULL WITH HER HANDS. SHE CAN NOT REMEMBER SOME OF THE DETAILS. IT WAS A FRENZY. SHE FOUND BRUISES, CUTS, AND BITES ON HERSELF THAT SHE CAN NOT REMEMBER HOW SHE GOT. SHE THINKS GETTING DOWN ON THE GROUND WITH THE PIT BULL WAS PROBABLY THE WRONG MOVE -- IT RISKED HER OWN LIFE. ON THE OTHER HAND, SHE WAS TOLD LATER THAT PIT BULLS TEND TO BITE THEIR PREY AND SHAKE, TEARING TISSUE IN THE VICTIM'S THROAT. HER ATTEMPT TO FIGHT FOR BELLA PROBABLY KEPT THE PIT BULL FROM SHAKING HER. BOARD IN HAND, STOOD BETWEEN HER AND THE PIT BULL AS IT CIRCLED !!!!! "I CAN'T LET IT GO," SHE SAID. "I THINK WE HAVE A RESPONSIBILITY TO LET PEOPLE KNOW ABOUT THE DANGERS." UITENHAGE SOUTH AFRICA - A BOERBOEL CHARGES OUT ON A WOMAN WALKING AND ATTACKED HER - HER ARM HAS TO BE AMPUTATED !!! UPDATE: HEILA GREEFF, 49, WAS WALKING DOWN SIR THOMAS MUIR DRIVE IN AN UPMARKET RESIDENTIAL AREA OF THE TOWN JUST BEFORE 8 AM WHEN A BOERBOEL (MASTIFF), WHICH HAD ESCAPED ITS OWNER'S PROPERTY, CHARGED HER. A woman lost her arm when she was mauled by a BOERBOEL in Uitenhage on Thursday, Eastern Cape police said. The woman was attacked while walking in Vanes Estate. The Boerboel dog ran out into the street to attack her. A neighbor heard the woman's screams and tried to help but was also bitten. The woman was rushed to the Netcare Cuyler Hospital, where her right arm was later amputated. She is in the hospital's intensive care unit. The owner of the Boerboel asked for help in taking the dog to a vet. It is not determined yet what is to happen to the dog. INTERNET PICTURE - 110 TO 170 POUNDS - BOERBOEL LITERALLY TRANSLATES INTO "FARMER'S MASTIFF"
UPDATE: VICTIM CRITICIZES CITY AFTER DOG BITES AGAIN !!! Corey Millard pushed a female PIT BULL off his son and the dog turned on him taking a chunk out of his leg. An ambulance rushed he and his son to St. Luke's Hospital where Chance received 6 stitches to close a gash on his right leg which was deep enough to see the bone, and he had puncture wounds on his leg, arm, and buttocks. Corey Millard suffered a 3-inch wound on the back of his right calf and his lower leg has been numb ever since. He may have nerve damage. The Pit Bull owner had a friend visiting and he had asked if Chance could play with his friend's little boy. The 2 boys had played at the Millard's apartment and then had headed back across the quiet street. When the friend's little boy opened the door, THE 3 PIT BULLS RAN OUT AND WENT AFTER CHANCE. The dogs' owner and his friend helped restrain 2 of the Pit Bulls, but a white Pit Bull remained loose..
Corey Millard was very surprised to see 2 of the 3 Pit Bulls still at the house across the street when they returned Saturday from the hospital. He learned later that Animal Control had only taken a black Pit Bull away from the home, based on the dog owner's account of what happened. He called police Saturday, urging them to impound the other 2 dogs, but was told nothing could be done until animal control was operating on Monday. On Monday animal control returned to remove the other 2 dogs but Diane Webber, animal control manager, said she could not confirm yet that all the dogs were involved. Weber said if the investigation reveals that any of the dogs should be declared as dangerous, a citation would be issued that the pet owner can challenge in court. If a judge upholds the city's citation, the dog or dogs would be no longer be allowed to live in Cedar Rapids. Chance Millard's grandmother who lives down the street and heard her grandson's screams, says Cedar Rapids should consider banning Pit Bulls just as some other Iowa cities have done in recent years. "OUR LAWS NEED CHANGED. LOOK AT HOW MANY KIDS HAVE BEEN MAUJLED AND KILLED. HOW MANY MORE IS IT GOING TO TAKE?" CHANCE'S GRANDMOTHER ALSO SAID THAT THE YOUNG BOY WHO OPENED THE DOOR TO LET THE PIT BULLS CHARGE OUT AND ATTACK CHANCE THINKS THE ATTACK IS HIS FAULT. SHE TRIED TO REASSURE HIM THAT IT WAS THE DOG'S FAULT AND NOT HIS. MY PERSONAL COMMENT TO THE GRANDMOTHER: IT IS BOTH THE OWNER'S FAULT AND THE PIT BULL'S GENETICS THAT CAUSED THIS ATTACK IT IS ALWAYS BOTH !! !